The all-rubber Super W pad is usually the best pad for isolating vibration. 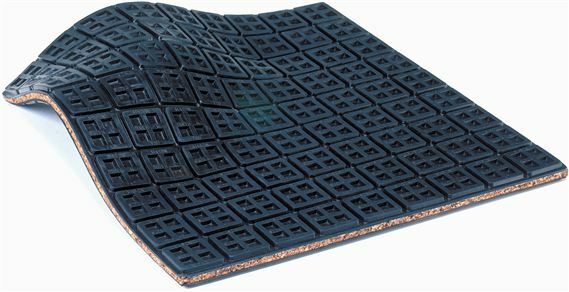 However, many contractors are used to the cork and rubber composite pad and are hesitant to change. We have a new cork and rubber pad, the Super K, that is a great improvement over what's out there now. A lower duro rubber, glued to both sides of a cork core, gives the equipment a quieter ride. The modular 2" x 2" design with a thin membrane between allows the contractor to easily cut and separate the Super K pad with a box cutter or utility knife for just the size he needs. Sold in full sheets only; they are easily cut to any size needed!